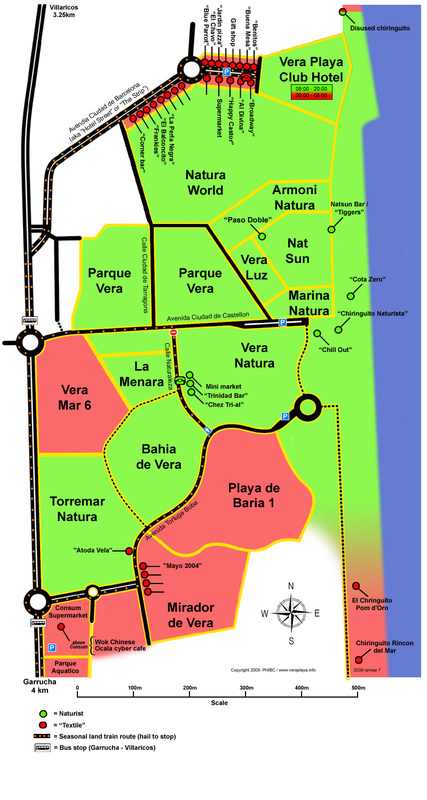 As a result of the hard work of one of our forum members (PhilBC) we now have a much improved map/plan of the Vera Playa naturist zone and its immediate surroundings. This has been a mammoth labour of love by PhilBC for which we are very grateful. He has also kindly said that he will incorporate additions and improvements to the map as time goes on. The new Plan is already now at version no. 7 (5 December 2009) - this latest version incorporates the new road from Parque Vera to Hotel Street which has now opened and it removes some commercial enterprises which have closed down, probably due to the recession. New enterprises may be expected to occupy these premises by next season (n.b. As at any seaside resort, business is mainly seasonal and most bars, cafes, restaurants etc close for a period in the winter for their own holidays and some close for the full winter period. Please do not assume that just because a business is shown on the plan that it will necessarily be open if you visit in the winter). The plan image is a large file (378KB) and so will take time to load if you are using a dial-up connection to the internet - be patient! Scroll down to see the full length of the plan - if you have a small browser window or you are using a small monitor you may also need to scroll horizontally to see the full width of the plan. For notes on the map/plan scroll down to below the plan or click here. Please note that this plan is copyright - all rights reserved PhilBC & www.veraplaya.info 2009 - and may not be published elsewhere without our explicit permission. Individual copies may be printed for purely personal non-commercial use - to print out the plan only right click on the plan and select "print target". You may need to preview how the image will print out and in particular you may need to select "shrink to fit page" (or similar depending on which internet browser and printer/printer software you are using). 1. The Vera Playa naturist zone is NOT a naturist centre. No one person or company or organisation owns or controls the zone as a whole - individual properties, mainly apartments, are owned by a myriad of individual owners. It it is just like any other seaside development of apartments, houses and hotels. Nearly all the properties in the zone are in one or other of a dozen developments or urbanizacions which have self-governing Owners' Communities which provide communal services such as swimming pools and gardening. There are no gates or barriers on the zone as a whole and the zone is intersected by public roads. Most urbanizacions do have fences and gates, partly for security and partly so their facilities are only used by their own residents and authorised visitors. 2. Not all the developments are naturist - on the plan the naturist developments are shown in green. The textile developments are shown in red. There are a number of individual houses but these have not been shown as the plan would become too 'busy'. 3. The naturist zone is about 1 km long from north to south and about 0.5 kms deep from the back of the beach to the main road (Garrucha to Villaricos). 4. The roads shown are as they exist now. Custom and practice is to regard the streets within the naturist zone as also naturist, though this may not actually be the legal position - nobody seems to know! 'Hotel Street' , the Vera Playa Club Hotel (which owns it) insists is textile, though in high season (late July & August) it becomes naturist in daytime by sheer force of numbers. 5. Free car parking is available for visitors wishing to use the naturist beach - the largest car park is on the road between Vera Natura and Marina Natura/Nat-Sun. There is also car parking available on the road south of Vera Natura (next to Playa de Baria). There is car parking available in 'Hotel Street' for people using the shops, bars etc. 6. There is now only a relatively small area of land undeveloped (between Parque Vera, the main road between Garrucha and Villaricos and the upper part of Hotel Street) - this area is shown in white on the plan. It is not clear whether naturist or textile properties will be built there - but the likelihood is that for a year or two at least in the current economic climate the site will remain undeveloped. 7. The naturist beach is over 2 kms in length but in reality that part of the beach which is south of the naturist zone itself is heavily textile - or optimists would see it as a "free beach" naturist and/or textile according to people's preference (see homepage story about our campaign to get naturists to use it more lest it become just "textile"). PhilBC has, very reasonably, shown the beach as green (naturist) shading down southwards to red, which reflects the reality that south of Playa de Baria 1, although the beach is designated as naturist, it is predominantly used by textiles. We hope this new plan is helpful to prospective visitors. If you have any additional information or corrections please let us know so PhilBC can incorporate them in his next edition.